To view more important royal portraits for sale, please go to www.philipmould.com. This portrait is a rare and newly discovered work from the Jacobite era. Until recently it was thought to be a portrait of a French nobleman. 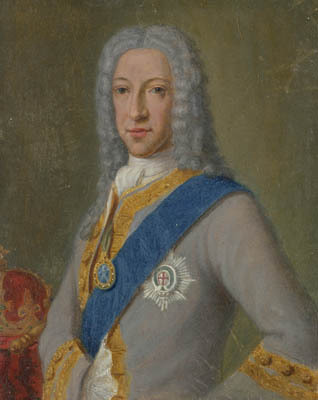 However, the blue garter sash immediately marks the portrait out to be of an English sitter, and in this case a portrait of James III, the ‘Old Pretender’. The portrait is a reduced version of a portrait of the Pretender done by Cosmo Alexander in Rome, probably in 1749 (Private Collection). Cosmo Alexander’s artistic career was dominated by his ardent adherence to the exiled Stuart kings of Scotland and England. This particular portrait would have related to one of defining commissions of his career., an occasion he celebrated by painting a small self-portrait in which he is seen completing the original picture of the King [Private Collection]. Alexander was born in Aberdeen into an artistic family, but the young Cosmo’s early artistic career was interrupted by his part in the Jacobite rebellion of 1745. Declared a wanted man after the battle of Culloden in 1746, he was forced to flee to the Italian court-in-exile of the Stuarts. He there found a ready market for portraits among the sizeable Scottish community, and before long, in 1747, received a commission from the Pretender himself. In 1749 he was again commissioned to produce a series of the Stuart family; James, his late wife Maria Clementina, and his two sons, Prince Charles and Cardinal York. Portraits of the exiled James III, or ‘The King over the Water’ as he was known by supporters, were a vital part of keeping the Stuart cause alive. Such works were chiefly political, or propagandist, and designed to create, or maintain, loyalty among Stuart followers. Miniatures and smaller scale portraits such as the present example were particularly valued for the ease with which they could be despatched to followers across Europe, or secreted back to Britain. There was an added demand for Jacobite portraits after Bonnie Prince Charlie’s romantic failure in the invasion of 1745. For Alexander, such royal patronage became his livelihood, and he continued to paint portraits of the Stuarts, and their followers, when he moved to Paris in the early 1750s. James’ 1747 commission was undoubtedly a breakthrough moment in the young artist’s career. Following the collapse of Jacobite support in England in the 1750s, Alexander was able to return to London, and eventually Scotland in 1755, where he continued to paint portraits of the principle Jacobite families. However, he seems never to have lost his itinerant spirit, and later worked variously in the Netherlands, and most famously in America, where he took on a young Gilbert Stuart as his pupil.